Laura had inherited one of the two diamonds from her mother's engagement ring, but this avid gardener is not a "ring person". She had earrings in mind, and because she lives in my former home city, Toronto, I suggested she visit my favourite jewellers there, Artwork by Collins and Chandler, as a start. Habituées of the tiny shop on Avenue Road call it "Pam and Don's". Laura seemed a match for their designs, which I consider world-class. When thinking of a commission, the first thing to do is take a close, leisurely look at a jeweller's work. Ask yourself if you'd wear much of what's on display, because that is the sensibility from which she will create. 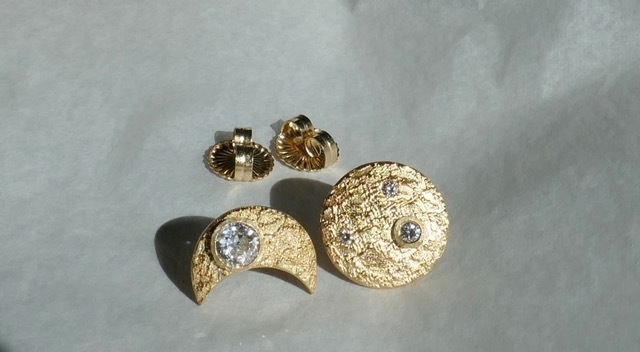 Laura liked what she saw, so she returned with her mother's diamond, a pair of earrings she received from her parents when a young adult, a small diamond from her maternal grandfather's bar tie pin, and some old gold to recycle. I was intrigued by the shape Laura wanted: two phases of the moon. She explained, "The moon had a special significance to my late husband. 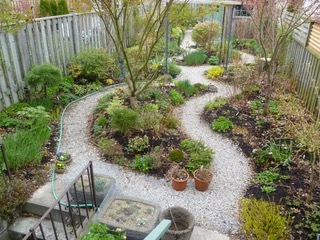 I also used the crescent moon as the basis for my garden design—there are two moons facing in opposite directions. So the earrings are meant to reflect those two very important parts of my life." She treats me to close-ups of her beautifully-conceived and maintained beds as they move through the seasons. When she travels, it is often to visit renowned gardens. She sent me the photo above to ask what I thought; the diamonds are not yet set. (At the top are other Artwork earrings, which made me want to get on a train immediately.) Tricky, because she'd be wearing them, not me—but I had a hunch and offered it to her. Laura loves colour, but she's understated. Like her garden, she's lovely in a natural way. Placed centre stage on the crescent moon, the largest diamond (about .60ct) had a presence Laura wasn't accustomed to; it looked as if it were saying, "Well HI THERE!" I said, "Now is the time to deal with any reservations, and it's not too late." I mentioned the phenomenon of diamond shrink. What seems like a honkin' big stone calms down; it literally seems to shrink before your eyes. You get used to it, in a good way. I thought she'd find it perfect once she wore them awhile. She wanted some time to think, so called Pam to ask her to hold off on the setting. If still uncomfortable, Laura had some options: move the biggest stone to the full-moon earring, which would then mean buying new diamonds for the crescent; recut it (resulting in a smaller diamond with a more modern cut) or use a mix of diamonds and other stones. Any option would have to be carefully considered to retain balance in the design. She decided to go ahead, though understandably felt both anxious and excited. First, there was matter of handing over family heirlooms for melting. She wryly mentioned "WASP guilt". But having inhabited WASP families, I've seen that while they revere tradition, they also abhor waste, and those stones and fiddly gold chains had no life as they were. The scariest part, she said, was in trusting Pam and Don. Laura is a world traveller, but with this project, she was in uncharted territory. Instead of making drawings, the jewellers used other pieces as reference points, and discussed details. For a deliberate and detail-oriented person, this is a leap—but she made it, and says she's glad. And, she added, she would not have wanted to do it with someone less experienced. Laura's moons honour her husband, mother, grandfather, and reflect her abiding connection to nature; they are really "her". She enjoys how she can move them around, with the full moon on either ear, and the crescent turned to either direction. I'm looking forward to doing a little moon-gazing when Laura visits Montreal in May! They are utterly lovely. I know what she means because large stones can look like flaunting wealth, but they work perfectly in the most original design. What a wonderful story - and what a gorgeous design! I relived my own reno experience as I read this post...anxious and excited because it was a 'first' experience. The design work here is absolutely stunning. Those stones look comfortable - the talents of Don and Pam ensure that - and these earrings will be enjoyed forever. Wonderful! What a precious gift she's given herself -- with your guidance. Those earrings are utterly gorgeous, so sophisticated, so full of story. I hope she wears them often, not just for special occasions. Adore these stunning earrings, and the guidance you gave her. And those gardens are lovely. I've my mother's ring (which I helped her reset shortly after I got married and for an anniversary gift), which didn't turn out like I'd hoped, and several other diamonds. I've been pondering how to reset them all - to redo the ring? Have the small stones in a moi and toi ring set collet-style as tiny studs and have some pearls and jade studs set as interchangeable hangers from the small diamonds? Reuse the tiny side stones from my mother's ring into something? Now, with these moons (important to me as well for many reasons), I have another option. I know a few jewelers who do work locally, but really want to find someone with a vision to do something that I want (after my mother's ring experience, and reading your reno postings, I know far more now). I'm hoping to do something for my birthday - now, to find a jeweler! So beautiful! I'll imagine she has a dreamy moon garden as well. Many jewellers can work with you via Skype and e-mail, and I have done so successfully. Some I know work that way most of the time. It is a better strategy to do that than to settle for someone local whose style is not exactly a fit for you. I suggest first finding designs you love, then usinfvthe sttones you have that fit it. I have seen too many projects that use existing stones and turn out ( sometimes) looking incoherent. Some of the best renos use existing material but will add stones or other elements for harmony. That need not be expensive. When you do decide, we of course would love to see it. Yes,shamelessly begging, but these projects are so useful for others to see. Those are lovely. I'm not a diamond person but the idea of recycling gems is appealing. I love the earrings and think that the scale is perfect. Duchesse, you are the “blankie” of renos. We could do it without you, but feel so much better knowing you are here. Although I always enjoy your blog, I rarely comment. But these earrings. These are so beautiful. Your recent post about wearing different earrings comes to mind. How modern, but also how traditional these look. So fabulous. Thanks for sharing your friend's story. Thanks to everyone for the lovely comments and especially to Duchesse for her guidance. And yes, I wear them often!